St. Louis has had it's fair share of struggles establishing zoning guidelines and enforcing rules on new construction in our city, especially in our historic neighborhoods. I recently gave this topic some thought after reading a story about a group of citizens and Washington University students trying to fight poor suburban designs back in 1970. One of the latest examples has been unfolding for over a year in the McKinley Heights Neighborhood, a national and local historic district. The Qooba Foundation, at 1925 Allen Avenue, in the McKinley Heights Neighborhood has purchased several properties at the prominent corner of Jefferson and Allen Avenues to build a mosque. The neighborhood associations of McKinley Heights and Fox Park and everyone else I've talked to are in favor of a mosque, but not the design or the site plan which is in dire need of some compromise that respects the neighborhood's built environment and historic standards. Back in March, 2017 I wrote about this story unfolding and the neighborhood's inability to get the site plan to a place the neighbors and the developers can agree upon. The city's Cultural Resources Office (CRO) and Preservation Review Board (PRB) surprisingly gave the plan the thumbs up even though it is in clear violation of several historic design standards. Again, the city continues to turn a blind eye to compromise, smart site planning, neighborhood historic codes and worse of all, the will of the people. Citizens are on their own when it comes to fighting this kind of development... with the developer, with the architects designing the site plan and with the city itself. One defense a neighborhood can establish as a safeguard against awkward new construction that does not complement the area are Historic District Design Standards. McKinley Heights has put in the hard work and expense in both volunteer time and money to establish these exact rules. The McKinley Heights Historic District Design Standards have been in place since 2006. But, when it comes to the city doing their part upholding these design standards, the neighborhood has had mixed results. 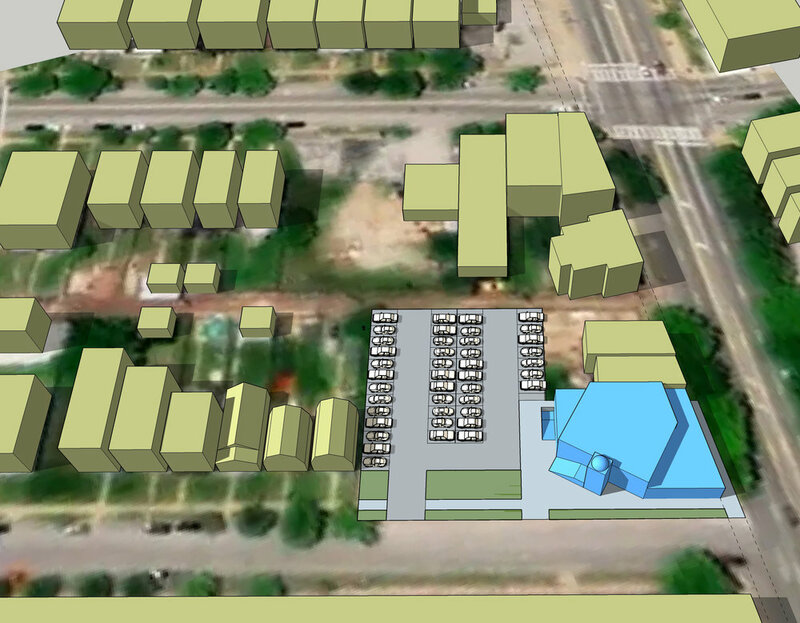 Again, back in January, 2017, the city's CRO and PRB disregarded the neighborhood's historic codes in favor of a suburban site plan complete with surface parking lining Jefferson and Allen Avenue with the mosque set back toward the alley at an awkward angle that was erroneously stated as being necessary for religious purposes. There was even informed testimony from a member of the board. Anthony Robinson, an architect who has designed two mosques who clearly stated at 1:19:39 of the following video that the building's orientation can meet both the historic standards and the religious needs of any mosque; he should know, he's designed two mosques himself in the suburbs. "What I do know is that, the building itself can be oriented such that it meets our historic district standards because only the qibla needs to face Mecca and with that being said, this design could in fact achieve both requirements that the neighborhood historic standards and that of the mosque. With that I find it difficult for me to just say 'yes' we'll allow the orientation of the building to be oriented the way it is." 504 Parking All off-street parking shall be located behind or to the side of commercial structures. Where visible from the street screening with visually opaque landscaping or 5’ minimum high masonry or concrete wall shall be necessary. Visually opaque landscaping is defined as a continuous hedge row of bushed planted 36” on center with a planting strip at least 5 feet wide. The planting strips with hedge row must also contain upper story shade trees planted every 25 feet along the planting strip. The trees must be at least 2 1⁄2” in caliper upon planting. This proposal includes parking in front of the mosque at the corner of S. Jefferson and Allen. At minimum the McKinley Fox ordinance calls for opaque landscaping screen or a masonry or concrete wall to screen such parking from street view. The city said: hey, just plant a couple trees or build a wall. That'll take care of everything. No one will notice that surface parking lot right up against Allen and Jefferson. Gladly some logic prevailed when the neighborhood and the Qooba Foundation were both in full opposition of the CRO suggestion. But, that example just shows you what the citizens fighting for decent urban design and city-building are up against. The building will be shorter than some surrounding structures due to its unusual design requirements. 501.2 Scale The scale of all proposed new construction in the Corridor must respect the existing scale of any surrounding historic structures by seeking to minimize the difference in height, mass, fenestration, and location. Any additions must be compatible with both the existing building and the surrounding structures. This is an unusual property type whose program will make it difficult to conform to the scale of surrounding buildings. The use of brick as the exterior material will create a relationship with adjacent buildings. The applicant has made significant design alterations based upon staff recommendations. The use of brick as the primary building material will be instrumental in creating a design relationship with adjacent buildings. Nope. It's all about the design and site plan. But, I'm no architect, why take my word for it? It there a better design that could appease everyone? What's next for this important, high-profile corner of our city now that the city has given the suburban site plan the preliminary thumb's up? To learn a little more from people who've been intimately involved in attempting to defend the neighborhood's historic codes and come to a compromise solution that is equitable for all parties, I sat down with Rocco V. Danna, the Head of Development for the McKinley Heights Neighborhood Association and Jay Reeves, the Chair of Development and Historic Standards Committee of the Fox Park Neighborhood Association (Fox Park is the historic neighborhood directly west of McKinley Heights). Both Rocco and Jay are architects. They helped me understand just how bad this plan is and how much better it could be with just a little intelligent, urban design and sensitivity and respect for the rules that are in place; the rules that anybody must adhere to as a starting point in negotiations. This plan is far below the minimum requirements and doesn't even come close to trying. For some reason, these rules have been preliminarily dismissed by the CRO/PRB for dubious reasons. What has been the neighborhood's reaction to the mosque? "100% support for the mosque. Qooba Foundation is already a welcomed neighbor and important member of the community." What about the site plan? "20 voting members in attendance at a recent neighborhood meeting voted in favor of appealing the current plan that does not meet the neighborhood historic standards. Only 1 voted against." "The neighborhood association presented the design to the alderman at a McKinley Heights Neighborhood board meeting and expressed their concerns.. The alderman chose not to side with one party or the other, so we were on our own." Have you reached out to the Qooba Foundation to discuss the site plan? "Yes, the McKinley Heights Neighborhood Assoc. met with representatives of the mosque on multiple occasions. All we ask of any development is to meet the minimum requirements set forth in the historic codes for new construction." "Well, despite the neighborhood's objections, the design passed preliminary review at the Board. At the preliminary review that allows the design to move forward, only 3 of the 9 voting members were present. Upon issuance of the permit, an appeal can be requested by the Neighborhood Association. That request for appeal was made on February 28, 2018." Show up to the meeting if you like and watch this unfold. These are open to the public. Regarding the alderman, what a lack of leadership. No consensus building, no conversation, no careful consideration, just deferred leadership on display here. But, obviously a safe move from a political/career standpoint. The easy path is just that, but not impressive. I reached out to Coatar to get his side of the story, no response. The lack of leadership at the local level led to enablement of a non-compliant design by the CRO/PRB and there you have it. History repeating itself with suburban site plans right in a historic neighborhood. No one in power had the courage to say “let's do the right thing for everyone”. Here's how corners, streets, and neighborhoods get eroded into the cheap look of the suburbs. Now to Jay Reeves on the design that was granted a building permit and a look at the neighborhood's preferred strategy that could work for both parties. As someone living in the neighborhood directly across Jefferson, how have you seen this project evolve? "Sadly, the two sides have had a protracted and emotional exchange. It is unfortunate, because this is a problem that can easily be resolved with thoughtful design. Compliance with the Historic Standards are a minimum threshold for new development. Cultural Resources have reported that this project does not meet those minimum requirements. I think most who look at the building objectively would also agree. What are some of the main issues with the design that has received a building permit? "As CRO staff reports in their summation to the PRB, the building is poorly sited, disrupting the urban fabric and ignoring the context of the neighborhood and the larger city grid. This simply should not happen in a Historic District. The front facade of the mosque is directed at the side and rear of the adjacent house. 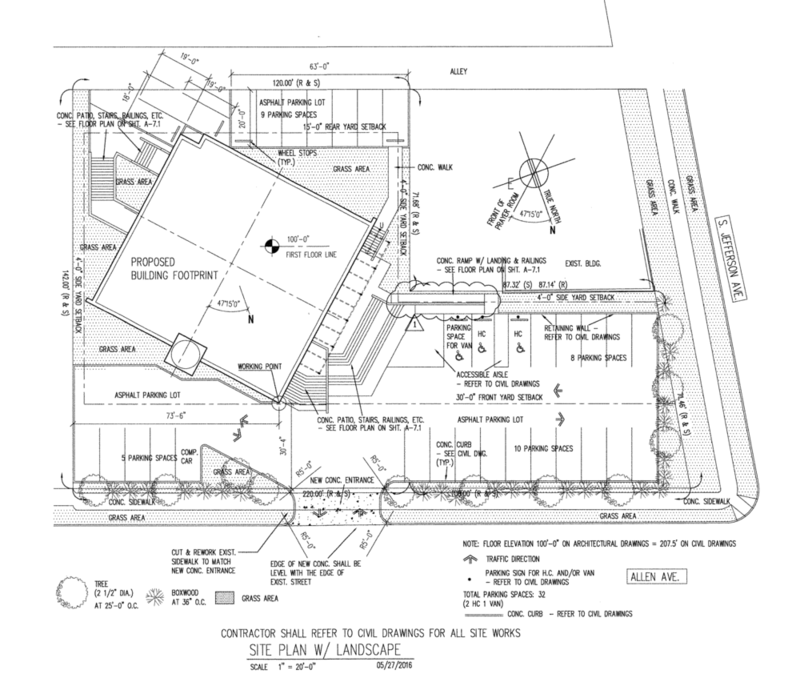 The development justifies such a site plan by pointing to the required orientation of the prayer room. A more nuanced design could accomplish both the program requirements and satisfy the Historic Standards. The parking that has been proposed does not appear to work well and is outside of the spirit of the district requirements. The standards first recommend that parking be in the rear and screened from view if it must be positioned in the front. This parking arrangement is primarily in the front of the building and well beyond the line of the residential facades. If observed carefully, one can see that vehicular circulation does not work well either; there are multiple pinch points and conflicts for incoming and outbound vehicles. Furthermore, it focuses the primary parking load toward the corner of Jefferson and Allen rather than siting the building in this zone which would reinforce the continuity of the Jefferson corridor. Relative to the building design itself, applying brick cladding to a building does not equate to contextual design as it was presented to the PRB. That said, the standards for commercial design allows for a wide variety of solutions in these neighborhoods. Frankly, the site plan is so poor, it is hard to focus on the liabilities of the building design. The entire point of having Historic District Designations is to avoid these kinds of conflicts and put pressure on developers to do better in these special neighborhoods." Neighbors got together to provide a solution for both the integrity of the neighborhood and the needs of the development. The above images are not intended to be prescriptive solutions, but clearly demonstrate what PRB Board Member Anthony Robinson states that a design satisfying the Historic Standards and the needs of a mosque are plausible. Each diagram respects the setback of the homes to the east along Allen Avenue. The corridor along Jefferson is maintained as well, without surface parking abutting both streets. Image on the left is the non-compliant design, and on the right a design with the same building dimensions and a compliant solution. So on March 26, the PRB will hear the neighborhood's appeal to the building permit and either allow the project to proceed as-is or ask the developer to revisit the design.